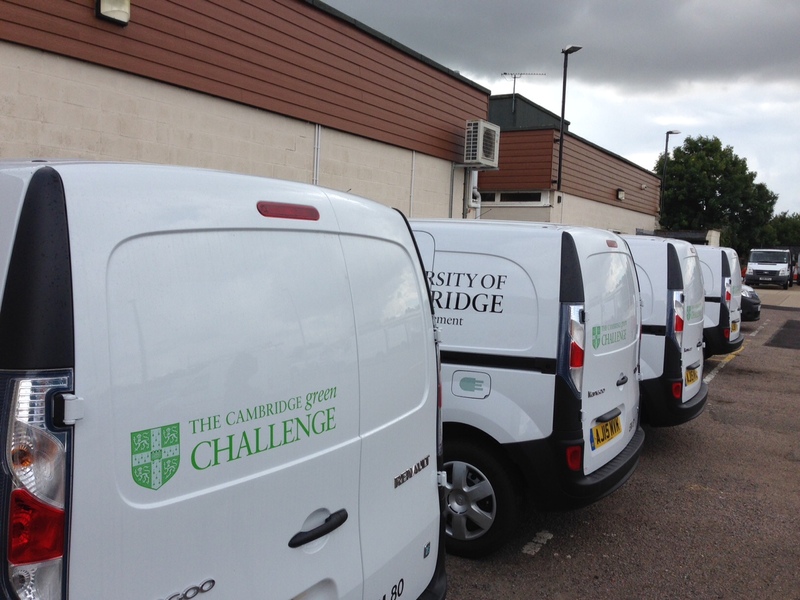 The Cambridge Carbon Challenge 2018 invites staff and students to submit their innovative ideas for reducing air miles and finding alternatives to flying, in order to decrease carbon emissions across the University. Contribute to University efforts to reduce carbon emissions in one of the most challenging yet significant aspects of the University’s carbon footprint. Join and inform the debate about how we reduce emissions from air travel within the University. The winning individual/team will receive a hamper of goodies and £100 of train vouchers and be invited to the University’s annual Green Impact Award Ceremony as the Carbon Challenge 2018 winner(s). Read through the background information and T&Cs here. How might you build research networks other than through international conference attendance? How might you carry out research and disseminate your findings without flying? How can you fulfil your learning or teaching requirements whilst reducing your need to fly? How could the University incentivise you to use alternative modes of transport, or utilise video conferencing as an alternative to flying? You are welcome to reference, as examples of best practice, any steps that you already take to reduce the air miles associated with your research, teaching or learning. Do feel free to research best practice elsewhere, consult others, explore potential barriers and find ways to overcome them - whatever is needed to build your evidence base and show the potential for your idea to be put into practice here at the University of Cambridge. If you would like to discuss your thoughts and idea(s) with the competition coordinators, please email living.lab@admin.cam.ac.uk to set up a meeting. Fill in this online form by 2 April to submit your idea. You will receive notification of the judges’ decision by the end of April. The use of initiative and innovation in reducing the air miles associated with your research, teaching and learning. In particular, the judges will favour submissions that show and, where possible, exemplify the will to ‘do things differently’ as a means to reducing the need to fly. The potential for a similar approach to be adopted or implemented by other members of the University community. The judges will favour submissions that are backed up by examples or evidence of how the suggested approach is already being used by members of the academic community (either at Cambridge or elsewhere). The relative ease of implementation of the suggested approach, against its effectiveness in reducing the need to travel by air. The judges will favour ideas and approaches that can be adopted relatively easily by others, without compromising their academic endeavours. Proposals put forwards with evidence of thorough research and consultation will have a higher chance of success. This may or may not include the following: surveys, evidence of success in other similar contexts, trials, consultation with relevant staff/students within and outside of the University. The University has a target to reduce its per capita carbon emissions from business flights by 25% by 2020/21 (Environmental Sustainability Vision, Policy and Strategy 2015). In 2016/17, emissions from flights for business purposes (circa 15,000 tCO2e) made up at least 15% of the University’s total carbon emissions (including emissions from the University’s built estate). This percentage is based on the limited data that we currently hold on business travel that is undertaken by University staff and students. We know that, in practice, emissions from business flights are likely to be considerably higher than this. In addition, the total distance and number of flights taken by University staff and students are on an upward trend. The competition is a joint initiative by the Living Laboratory for Sustainability and the Energy and Carbon Reduction Project (ECRP). It aims to harness academic expertise and operational experience from across the University that will help us to improve our environmental performance and increase our capacity to reduce carbon. The judges of the Carbon Challenge 2018 will be: Ian Leslie, Senior Advisor to the Vice-Chancellor on Environmental Sustainability; Helen Wain, Head of Procurement; and Kevin Couling, Interim Head of Environment and Energy. 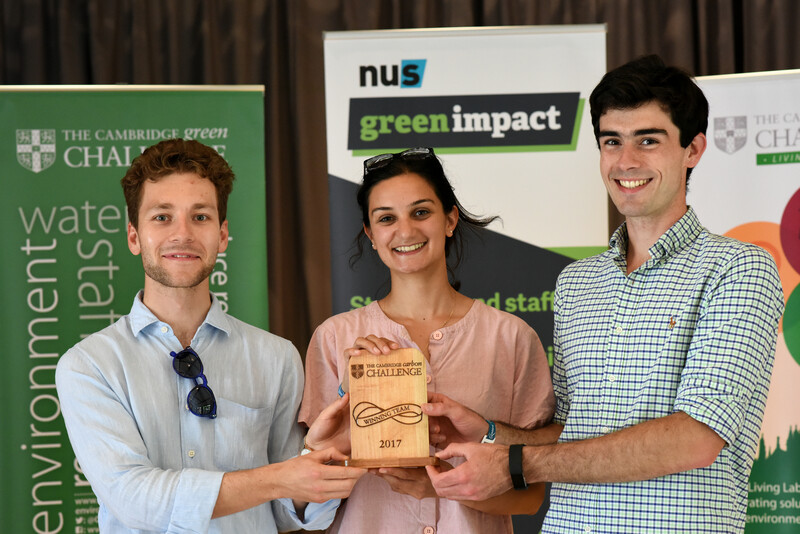 The Cambridge Carbon Challenge 2017 was a competition inviting staff and students to submit their ideas for reducing building energy use and associated carbon emissions (Scope 1 and 2 emissions) across the University estate. Mel, Andre and Mark, a group of PhD students, are making use of their own research to trial the use of hydroponics within buildings – a dense soil-less plant growth system – to lower building energy use. The presence of the plants reduces the energy required for ventilation and heating (due to lowering CO2 levels within buildings), with potential added benefits of enhanced health and wellbeing. The team have gained carpentry skills along the way, and drawn from a huge range of expertise and backgrounds to bring this together. Louis, Jesse and Shanshan are bringing the vision of Elon Musk to Cambridge. They have proposed the use of battery storage alongside solar panels at Laundry Farm (where the University’s fleet of electric vehicles are based). They want to demonstrate the benefits of batteries for maximising use of renewable energy and minimising cost. This multidisciplinary team (an Engineer, a Land Economist and a Physicist) met at the launch event and were impressive in their adaptability along the way. If you have any questions, please email living.lab@admin.cam.ac.uk.